« I’m making things a little bit betta! Coming up are a few events that I’m excited to share with you. Add them to your calendar and come by to say hello so we can catch up with each other! It’s a great show. Only one of two shows I’m doing this year. I’ll feature hundreds of new images, including many from my week at the Monet Gardens near Paris. It’s a charming venue with crafts, holiday ornaments, home goods and many fine artists doing painting and photography, like me. It’s a great mix of people and things to get you in the holiday spirit! Dozens of artists will be there. And, you may be surprised to learn that this is where I sold my very first piece of art sometime in 2000 or 2001. It was that ah-ha! moment when I thought, “Wow! I can do this!” and I’ve been making and selling art ever since. I was part of a small group of photographers privileged to spend a week at the Monet Gardens in June in the village of Giverny, France. Claude Monet (1840-1926) created the gardens in which he painted his famous impressionistic versions of flowers, lily pads and lilies. Our group had the gardens to ourselves for two and a half hours in the early morning and again in the early evening. 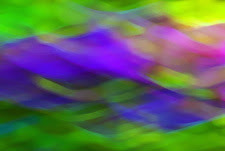 We learned, of course, impressionistic photography. Here are some examples of the techniques we used. The gardens were beautiful, full of blooming flowers and laden with the history of Monet’s work. The village of Giverny was enchanting, and the food was, as expected of the French, delicious. I will have Monet images for sale at the Elks Show on Saturday, 10/29/16 from 9 am to 3 pm. A formal reception in honor of the new, state of the art, Rideout Hospital in Marysville was on Saturday, October 15th. I am humbled that the Hospital has selected 57 of my flower images to be on permanent display on the hospital’s walls and it was great to see them in place during this event. The holidays are approaching. You don’t have to give your neighbor a fruitcake! 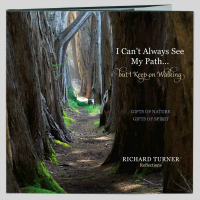 A meaningful gift, I might suggest, would be my book, I Can’t Always See My Path…But I Keep On Walking, warmly endorsed by the late Wayne Dyer and by heartfelt testimonials of hundreds of devoted readers. My Path is the perfect Christmas gift for family, employees, colleagues, friends. Purchase is easy. Go to the My Path page on my website here. 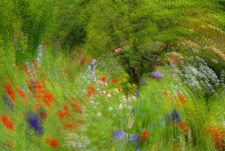 During the month of November, I will produce a show of 15 images taken in Monet’s Garden. The venue will be the Sacramento Fine Arts Center, 5330 Gibbons Drive, Carmichael. The Center is open Tuesday, 11 AM-7 PM, Wednesday–Friday, 11 AM-3 PM, and Saturday and Sunday, 11 AM-5 PM. The show will feature the broad and intense array of color found among the beautiful flowers and plants of Monet’s Garden. 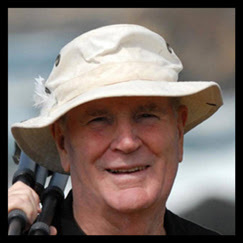 I hope to see you at the Elks Club on Saturday, October 29! This entry was posted in News, Photography Book and tagged book, Flowers, Garden, Impressionism, Monet, Photography, Richard Turner, RideoutMemorial, SacramentoFineArtsCentere.